Used for determining gravity and alcohol levels, monitoring fermentation. Includes Thermometer as well. Easy to read scales. 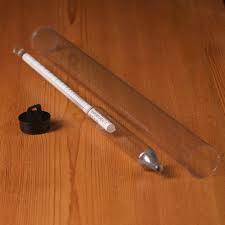 A hydrometer is a device the measures the density or specific gravity of a liquid. Hydrometers are calibrated based upon the specific gravity of water at 60F being 1.000. Liquids denser than water will have a higher specific gravity, while liquids less dense will have a lower specific gravity. To use a hydrometer, fill the test jar with the liquid to be measured. Place the hydrometer in the jar, giving it a quick twirl to dislodge any air bubbles. Once the hydrometer has settled, take the measurement reading from the scale on the side. Note: In order for the measurement to be accurate, the sampled liquid must also be at 60F. If the liquid is not at 60F, then the measurement must be adjusted. An adjustment scale is provided with the hydrometer. The container may be used as a test jar, but we recommend the Fermetch Thief, which draws a sample and can be used as a test jar as well. As an example, if your Original Gravity (pre-fermentation) reading is about 1.055 and the Final Gravity (end of fermentation) reading is approximately 1.010, then from these two measurements we can calculate the alcohol percentage by taking the corresponding potential alcohol readings and taking the difference between the 2 readings.